Begun in 1914, HUMC is one of the oldest gatherings of black clergy in America. Interdenominational and intergenerational, HUMC has grown from 40 attendees at its inception, to over 7,000 in 2013. This year’s attendance is expected to top that figure. Former attendees and speakers at this dynamic, week-long conference have included Civil Rights Icon Rev. 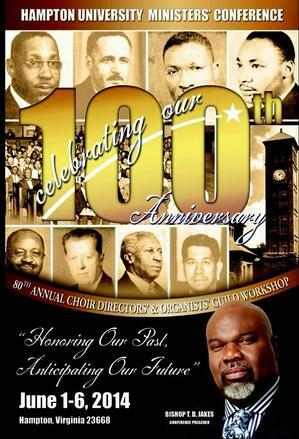 Dr. Martin Luther King, Jr., Theologian Dr. Howard Thurman, and Bishop T. D. Jakes, who is slated to be this year’s keynote speaker. People have been tweeting at #HUMC2014, and posting FB, IG, and other social media updates from this phenomenal conference all week long. The Hampton University Ministers’ Conference (HUMC) continues to be a theological, spiritual, and educational jewel. Btw, for a real taste of the Conference, IG (Instagram) has pics and video at #HUMC2014! What are your thoughts on the role of digital technology and social media at ministerial conferences? Did you attend the Hampton University Ministers’ Conference 2014? If so, what did you think of it? Please share your thoughts, photos, and videos with our readers. Appreciate you!